A good night for NBC and FOX. NBC: THE WALL jumped 0.4 to 1.5, and the season finale of BETTER LATE THAN NEVER was up 0.2 to 1.1. However, the pre-Olympics BEST OF THE BEST special was quiet at 0.6. FOX: LUCIFER climbed 0.2 to 1.0, and THE RESIDENT was up 0.1 to 1.0. 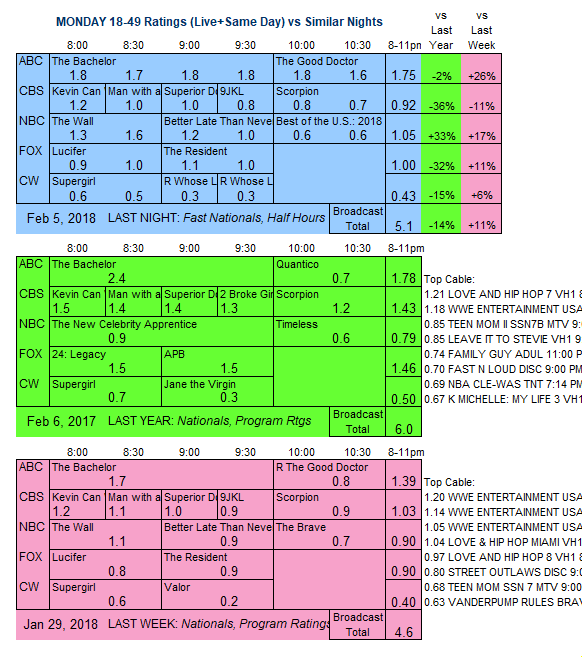 CW: The last SUPERGIRL until April was steady at 0.6, then a pair of WHOSE LINE IS IT ANYWAY reruns were at 0.3/0.3. 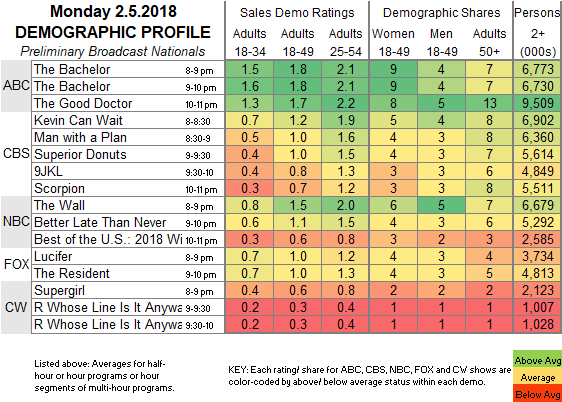 ABC: THE BACHELOR gained 0.1 to 1.8, and THE GOOD DOCTOR, returning after a rerun week, held at 1.7. CBS: KEVIN CAN WAIT was steady at 1.2, MAN WITH A PLAN slipped 0.1 to 1.0, SUPERIOR DONUTS remained at 1.0, and the season finale of 9JKL was down 0.1 to 0.8. SCORPION fell 0.2 to 0.7. NBC’s already-renewed ELLEN’S GAME OF GAMES ends its initial season tonight.